CLEARFIELD – After deliberating for approximately two hours and 41 minutes Thursday afternoon, a jury of eight women and four men convicted a 20-year-old Madera man of third-degree murder. Johnathan Blair Maines was also found guilty of aggravated assault, simple assault and recklessly endangering another person. He was found not guilty of first-degree murder. District Attorney William A. Shaw Jr. prosecuted the case on behalf of the commonwealth. The defendant was represented by attorney Josh Maines of Clearfield with whom he has no family relation. 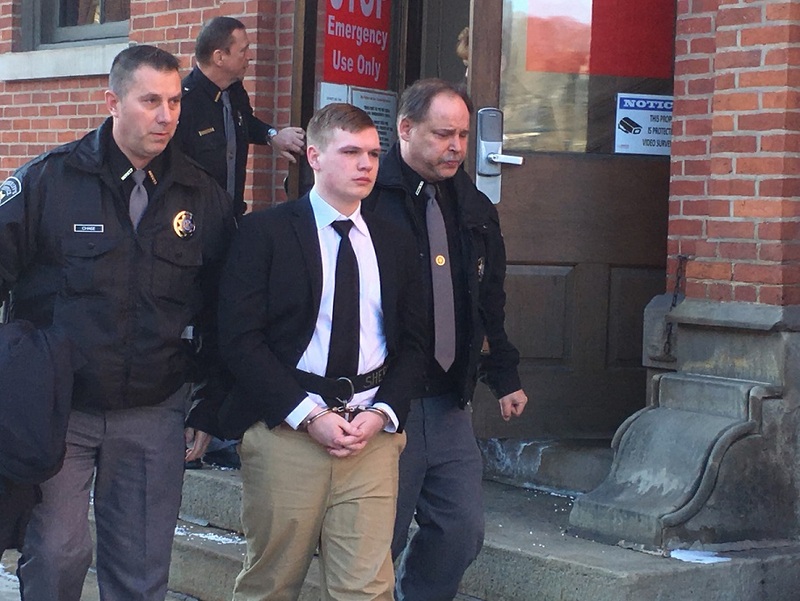 Johnathan Maines will be scheduled for sentencing before Judge Paul E. Cherry within 60 days, and Shaw anticipates that he will spend 20 – 40 years in state prison for this conviction. According to trial testimony, Johnathan Maines fatally stabbed Joshua A. Sahm, 30, of Blandburg in the back and neck March 20, 2018 at a Main Street apartment in Madera. Both men partied at the “drug house” the night before and into the morning hours with several other residents, including Rick Weatherholtz, the primary tenant; Ashley Storm, Johnathan Maines’ girlfriend at the time; Jesse Breeden, Storm’s ex-boyfriend; and Keith Pinter. All six used methamphetamine that was supplied by Sahm. At one point, the defendant wanted everyone out of Storm’s room. Storm, however, said no and let them stay, and Johnathan Maines left the room to get away from the tense situation. Witnesses said later that afternoon, Weatherholtz and Breeden went to gather up scrap metal in order to get some money, leaving Storm, Johnathan Maines and Sahm upstairs in Storm’s bedroom and Pinter on the living room couch. According to trial testimony, Sahm fell asleep in Storm’s bedroom and she left to use the bathroom. Johnathan Maines followed to see what she was doing and appeared to be agitated about something. She suspected he was jealous because she had been flirtatious with Sahm in front of him. Moments after the defendant went back to her room, she heard someone say “so, you’re going to kill me, huh?” This, she testified, was followed by an “awful, painful” scream. They went downstairs and she asked what happened to which he repeatedly told her “I don’t know.” Both ran from the residence with Pinter to a garage; she and Pinter asked what happened again and got no answers. She asked for a phone to call 911 but neither Johnathan Maines nor Pinter gave her a phone. She and the defendant went back inside and she saw him wash his hands, change his clothes and hide his camouflage pants in a pile of laundry. According to trial testimony, he fled and told her to tell police that he was not there at the time of the stabbing. She went upstairs and found Sahm’s phone in a pool of blood; she used it to call 911. When emergency responders arrived on-scene, Sahm was found at the bottom of the front stairway lying in a pool of blood. He was breathing with a pulse and put in an ambulance for transport to UPMC Altoona but died prior to his arrival. A forensic pathologist – who conducted the autopsy examination – testified that Sahm died from stab wounds to his neck and back. He subsequently ruled his death a homicide. A Pennsylvania State Police DNA expert detected Sahm’s DNA in a blood stain sample from a pair of camouflage pants and Johnathan Maines’ DNA from a swab taken from the waistband/zipper pull. Following the trial, Shaw said it went as expected, noting he had to overcome repeated challenges “at every turn” to his witnesses’ credibility. He said it would have been “easy” for jurors to say “who cares” because it was a “bunch of druggies in a drug house” and one ended up dead. “Joshua Sahm wasn’t born a drug dealer, a drug user, and he’ll never have the opportunity to clean himself up,” Shaw said.